As with the Envoy Wide Angle, the Watson Premier Half-Plate is not, strictly, an Ilford camera, as it was not badged with the Ilford name. 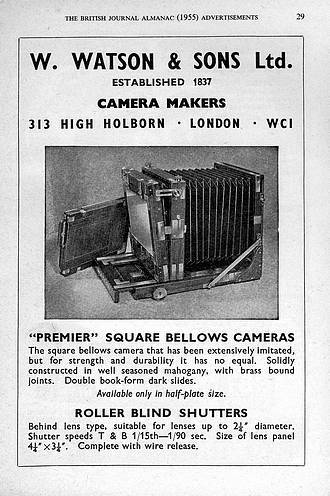 However, it was marketed by Ilford Ltd (see 1955 Ilford Photographic Materials, General Catalogue). Rajar Ltd was an off-shoot of the Brooks-Watson Daylight Camera Company Ltd, who opened a purpose designed photographic equipment and materials factory at Mobberley, Cheshire, in 1907. Iford acquired the Rajar factory site at Mobberley around 1928 and is now the home of ILFORD Photo. 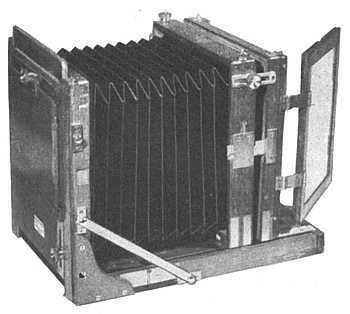 The Watson half-plate camera was a square bellows camera of traditional design suitable for commercial, scientific, architectural and general record photography. The camera and dark slides were made of polished mahogany, with fitings of lacquered brass. The bellows were of linen-lined leather. Focussing was by rack & pinion movement, acting on the camera back only, leaving the lens position fixed (i.e. it was a Tailboard camera). Provision was included for lens cross movement and rise & fall. Also, the back could be tilted in two planes. The focussing screen and dark slides could be used either in the vertical or horizontal position. Dark slides were of the double book-form type. Price of the camera (without lens) and 3 dark slides was £52.10s (£52.50p) in 1955 with extra dark slides costing £5 each.